Photo taken by: Engr. Elbert M. Malonzo... thanks so much, elbert! Gorgeous symmetry, and I love the smooth curve of the stem. Very nice framing. Oh wow... this is just so wonderful! Great colors, great picture! I am sure this'll grow to be a very beautiful butterfly in the future. Jenn Was Here and Embracing Myself. Please feel free to visit when you have the time. Happy Wednesday! cool catch for WW! Have a great Wednesday! That is so cool! Who cares about the butterfly, this is amazing! i never got the chance to go to butterfly farm but its really near our plan. but i plan to go there with my two year old daughter in the near future. btw, i am also from marikina. in hacienda heights. they kind of look like hammy from bugs life. The colors play well with each other. 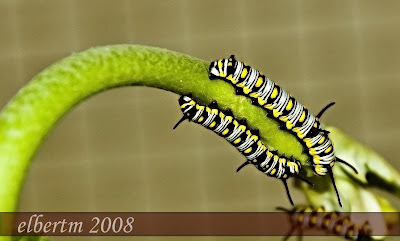 Beautiful caterpillar photos. They are amazing creatures. great picture. thanks for stopping by. That is a very beautiful photo. I love the colors. Great shot. Thanks for dropping by. Have a great week!